Happy Monday! Or I’m hoping it’s a happy Monday. This isn’t the post I intended on sharing today but things don’t always go as planned. Right now it’s Sunday morning and I’m stuck in snowy Boulder. As beautiful as it is it’s crazy to believe it’s April 17th and there is this much snow! I was suppose to head home yesterday but hoping to get home today. Just in case I thought I should get this Meatless Monday post scheduled, since even if my flight is on time I won’t get back to my house until after 10pm and a long day. I’m about to go enjoy the spa to try to relax before heading to the airport so I thought this delicious salad was perfect! 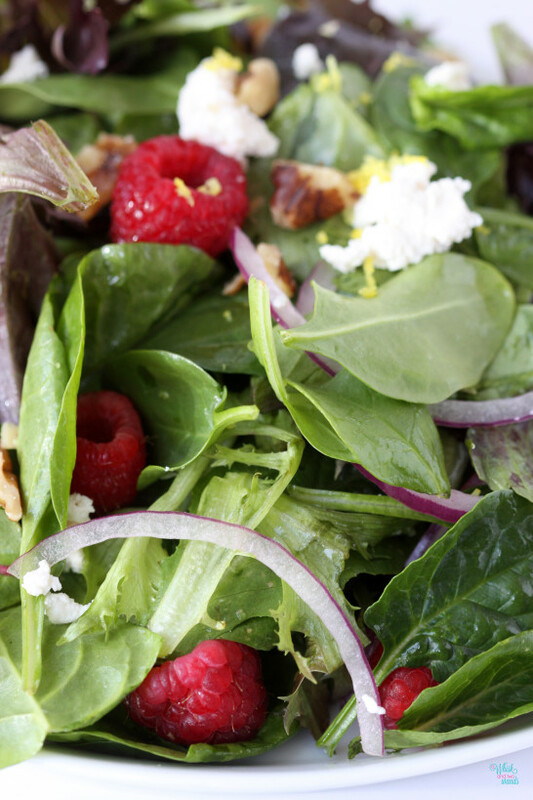 It’s no secret that I love my salads, and I like them packed with flavor! A couple weeks ago I shared a new product love, Kite Hill dairy-free (vegan) Ricotta Cheese! I’m not as huge of cheese fan as the rest of my family, I swear my oldest daughter and husband can’t go a day without it, and they all have some seriously good taste when it comes to cheese. When I was vegan there was nothing really good for cheese options but I was ok without it. As I transitioned into a vegetarian lifestyle for medical reasons, and more “flexitarian” if I had to label it which I’m not a fan, I realized I like cheese but it doesn’t always like me. Not being able to eat soy cheese (eliminated soy for medical reasons) I wasn’t too bummed because I wasn’t a fan. One day I wanted cream cheese and I’ve had some dairy free versions but they weren’t the best. The first Kite Hill cheese I got was a Chive Cream Cheese and one word, delicious! I had planned to pick up some other cheeses but hadn’t gotten back to the store and we were going to be traveling. Well just my luck I got to try all of the Kite Hill Cheeses at Natural Products Expo West and instant LOVE! Yes forget the belly aches and tummy troubles that I would deal with I can totally get down with these delicious cheeses. Ok so I made my Lemon Ricotta Asparagus Pasta (dairy-free, vegan) and a couple days later decided I would eat the remaining ricotta in a salad and with that bloomed this new love! 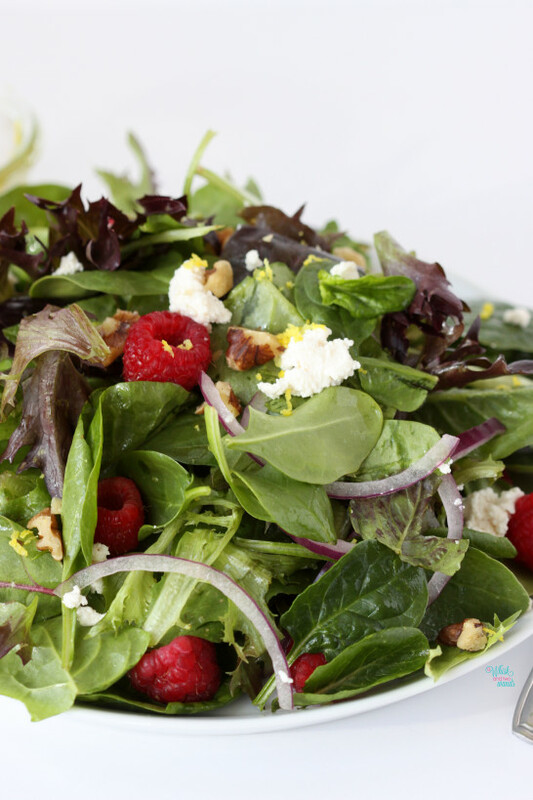 Fresh and flavorful Raspberry Ricotta Salad with a Lemon Vinaigrette! 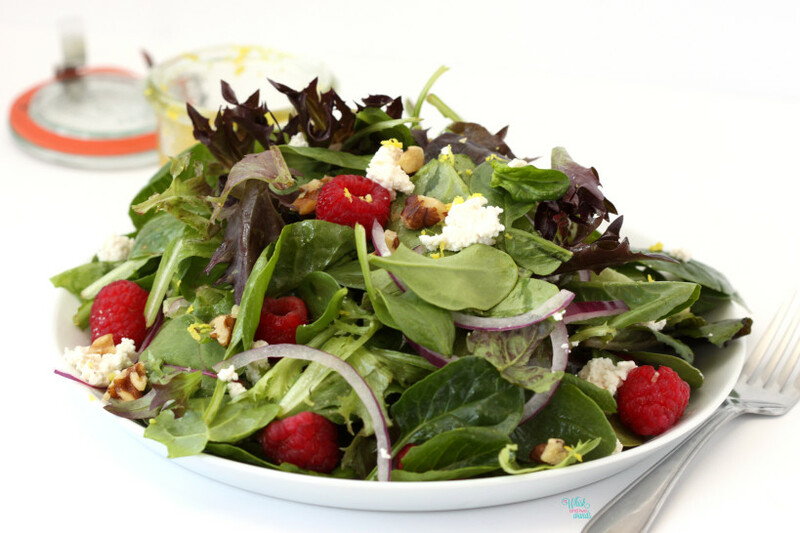 Wanting a lunch or dinner that is packed full of flavor and will satisfy you without feeling heavy, try this salad. It will not only be on repeat through the spring here but will be making appearances for picnics and dinners with friends and family because I know they will love it! 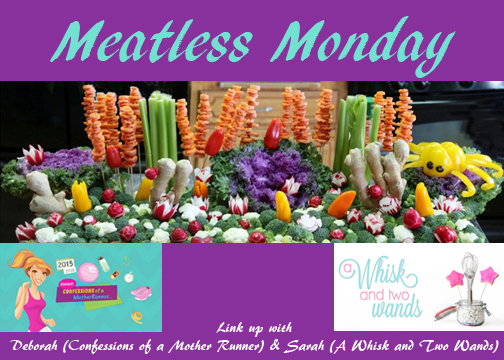 I hope you join Deborah and I for another fun and flavorful Meatless Monday! Link up with one of your meatless recipes below or check out what others are posting and hopefully get some inspiration for some delicious meatless eats to try! Prepare salad dressing. Zest lemon and add zest to a small glass jar or container with a lid. Add in juice from lemon, extra virgin olive oil, honey/maple syrup, and sea salt and pepper (adjust as needed). Shake to mix salad dressing together. In a large bowl toss together greens and a teaspoon of dressing. You won’t need a lot of dressing as you just want to lightly coat and not weigh down the greens, add more as needed and desired. Mix in onion slices, carefully mix in raspberries, walnuts, and ricotta or plate and top with the berries, nuts, and ricotta. Season with salt and pepper, or a little lemon zest if desired/to taste. Enjoy! Yum! 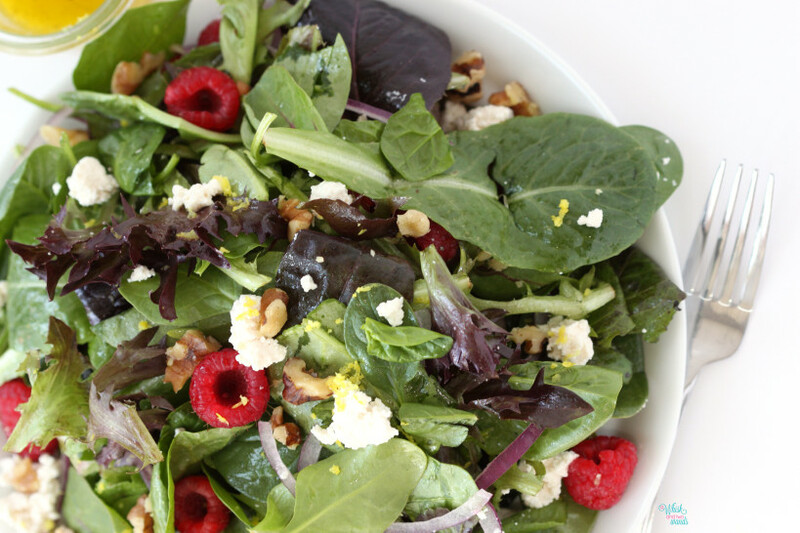 I love the addition of raspberries in this salad! Thank you Lauren, they add just the right amount of color and sweetness! Thank you for linking up with us. This is one yummy looking salad! Love the lemon vinaigrette too- can’t wait to give it a try! 🙂 Thanks for hosting the linkup! Thank you Annmarie! It’s simple and fresh. Thank you for joining us! What a lovely combination. I’m kind of a cheese freak too 🙂 Thanks for hosting. Thank you Julie and thanks for linking up with us! Their cheeses are so good! My Whole Foods can’t seem to keep them in stock. I just went again today and they didn’t have it in stock. It’s a good combo, I love a good salad! You too, happy Meatless Monday! I’ve never heard of Kite Hill! I need to look for it. I made a vegan lasagna a few weeks ago, and instead of ricotta ( not knowing a vegan option was available) I made cashew cheese, which was delicious and worked really well. Thanks for hosting! You will have to check it out Debbie, I get it at my local Whole Foods. It is a nut cheese made from almonds. I like using cashew cheese for lasagna and haven’t tried using the ricotta yet but it’s on my list. I bet your lasagna was delicious! Thank you for linking up with us. Ok so I don’t love ricotta but this salad looks so pretty and the lemon dressing sounds so tasty that I might have to just make it anyway! Rachel if you eat dairy chevere or feta would work in place of ricotta. Thank you the raspberries and lemon add a nice freshness to it that is perfect for spring! Oh, this looks so pretty and full of perfect flavors for spring! That salad looks divine. I love when there are sweet and savor bits to enjoy. Yikes on the snow. I bagged a race last week due to ice and snow and now I’m sitting here in 82 degree heat. Crazy! Thank you Marcia! The snow was just crazy, even being a Minnesotan I couldn’t believe it! Not to mention it was almost 80 back home in MN while I was sitting there snowed in. The weather seems to be having some pretty crazy mood swings lately. Bummer about your race. I need to find Kite Hill products STAT! YES you do! I also picked up some other dairy free cheeses today since they were out of Kite Hill, I’m hoping they are just as good! Me too… but this spring is starting off pretty good maybe I shouldn’t wish for the hot humid summer! O I like it! Nice and light and refreshing! 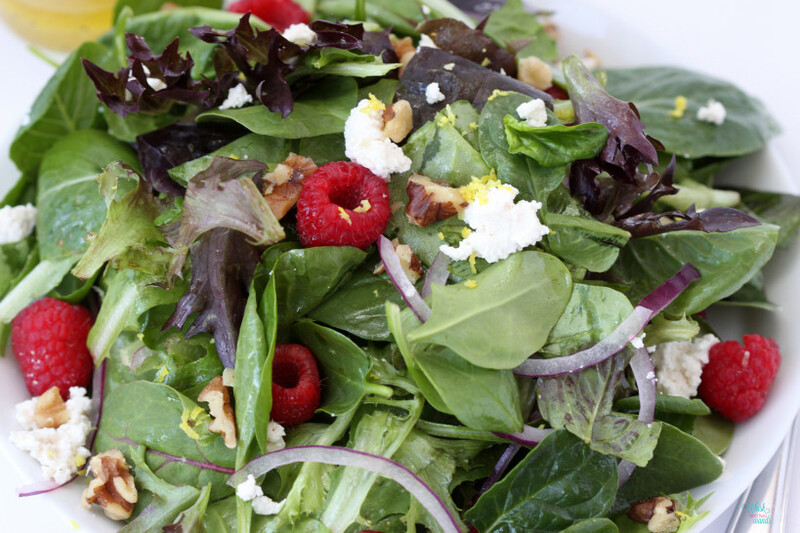 Thank you… and fresh and flavorful! Hi Sarah, this salad is really tempting and your clicks are so nice, I feel lie grabbing the salad from my laptop. Lol. Thanks for hosting, last week I didn’t join my new post was not ready. Ahhh, this looks so good! 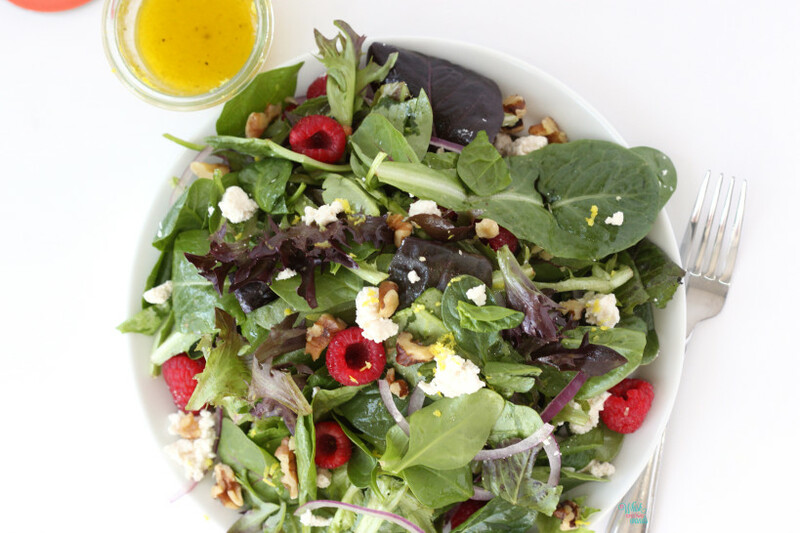 I love berries, and that lemon vinaigrette sounds amazing! This salad looks really good!